With function, fashion, and colour, Lug products are designed for women, men and families on the go – ideal for day to day life, and savvy travelers alike. 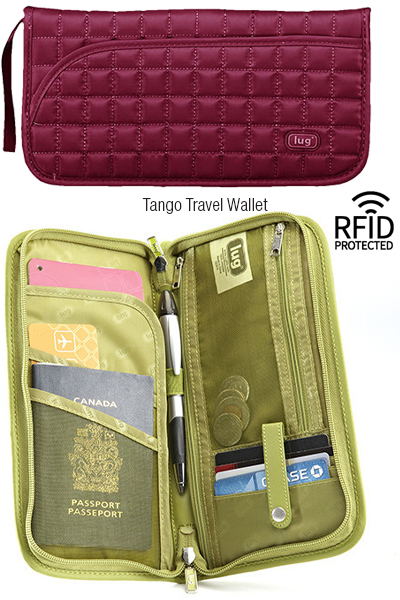 Put travel stress to rest with this uber-organizer, packed with special features, like the zippered coin pouch and the easy-access boarding pass flap. There’s a place for everything in this slim wallet – coins, cards, cash, passport, pen and it’s all kept close with a sturdy wrist strap. There’s no better way to travel smart. RFID-protected products safeguard your personal information from identity theft.